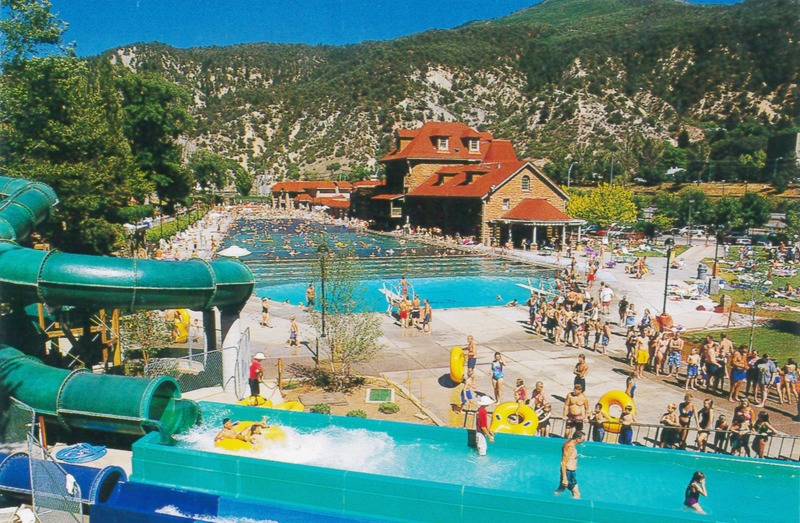 Glenwood Springs, Colorado, is home to the largest outdoor mineral hot springs pool in the world. Resort facilities were built in the 1880s. Glenwood Springs (population 7736) is on the western slope of the Rocky Mountains at the confluence of the Colorado and the Roaring Fork Rivers near the towering walls of the Glenwood Canyon. Known as Yampah (big medicine) to the Ute Indians and Defiance to the gold rush settlers, Glenwood Springs was incorporated in 1885. Home of the largest outdoor mineral hot springs pool in the world, the area has a long history of attracting visitors. Ute Indians used the Yampah Hot Springs as a place of healing, and resort facilities built in the 1880s became internationally renowned. The elegant 1893 Hotel Colorado, a copy of the Medici Palace in Italy, even served as the “Western White House” for President Theodore Roosevelt and his cabinet in 1905. Glenwood Springs was one of the first hydroelectrically lighted cities in the world (1886), having electricity even before New York City. Railroad service, hotels and saloons, and a diversified economy helped the town continue to grow when other mining communities faced tough times. Some colorful Western characters have lived in Glenwood Springs, including “Doc” Holliday, famous for the shootout at the O.K. Corral. Bank robber “Kid Curry,” a member of Butch Cassidy’s Hole-in-the-Wall gang, is also buried in town. Glenwood Springs has been actively preserving its history and promoting heritage tourism for more than forty years. The Frontier Historical Society maintains a museum and publishes a downtown walking tour of many surviving buildings constructed from 1884 through 1928. A full calendar of annual events includes vintage base ball and Strawberry Days, a historical celebration that now attracts 30,000 people. The City was honored as a National Trust “Distinctive Destination” in 2004. The depot is being restored as a railroad museum and work is ongoing on a proposed downtown historic preservation district. The community also benefits from the revenue generated by marketing its historic and natural resources for location filming of movies and commercials. Films from the 1902 “Runaway Stage Coach” to the recent “Mr. and Mrs. Smith” have been shot in Glenwood Springs.